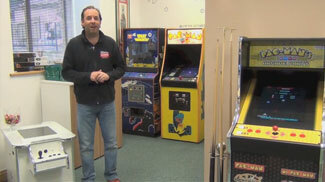 We specialise in selling high quality vintage arcade machines. Free delivery with all models. Call us if you don't see what you're looking for. We also purchase great examples. Vintage arcade machines are a real passion for us here at Home Leisure Direct, so we like to keep a stock of them available at all times. While most vintage games are available through emulators and multi-game arcade machines, sometimes there's simply no substitute for the real thing. Vintage arcade machines for sale at auction or privately are often real collectors' pieces, and can change hands for a lot of money, but we secure the best possible prices for these prized machines. There is now a growing demand for these instantly enjoyable and addictive arcade games. We have a constantly changing range of vintage cabinets, offering unmissable classic experiences for you to enjoy at home. At Home Leisure Direct we specialise in arcades of all sorts for sale in the UK. Authentic vintage cabinets are a specialised market and it takes our understanding to ensure you're getting a good deal, as well as a high quality machine. Where possible, original components are used, but in some cases this may not be possible due to wear and tear or simply age. Some machines we sell are over 30 years old, and parts can perish with time. The cabinets we sell are therefore restored to perfect condition however possible, and may have new circuit boards, new controls, new decals or new electrical components, ensuring they play as well as they did when they were brand new. Our vintage arcade machines are a real treat that can be enjoyed by young and old alike. If you have any questions about a particular machine we have on sale, or the refurbishment process, or just an enquiry about whether we can get a certain machine, feel free to call us on 0800 622 6464 or 01454 413636. Classic arcade machines have been loved by players of all ages, ever since they first appeared. After more than 50 years since the invention of computer games, they are still a massive part of our culture and the classic games have stood the test of time. They are still remembered with fondness and are still just as addictive and exciting as they always were, even to children and young people now. The rules are simple and the games require minimal hand-eye co-ordination to start with, so anyone can play and enjoy them first time, even if they can't get past the first level! Among the most popular and sought after vintage arcade games are Pacman, Ms. Pacman, Space Invaders, Galaga, Asteroids, Donkey Kong, Centipede, Tempest, Joust, Robotron 2084, Bubble Bobble and many, many more. If there are any games in particular you are searching for which are not listed below, please get in contact with us directly via phone or e-mail. Our range is constantly changing, but we are dedicated to only selling quality machines that are in excellent condition and pass our quality assurance checks. We will always state in our listings what processes have been done to an individual machine, and keep you informed of anything you need to know about the condition and upkeep of the machine. All of our vintage arcade machines are quality tested and suitable for the UK market. They have all passed the relevant safety checks for vintage arcade machines of this type. For further advice on our vintage arcade range, please call us free on 0800 622 6464 and speak to a member of our expert team who will be able to answer any questions you might have.